You're invited to join the Pittsburgh Film Office for the Netflix Lights! Glamour! Action! 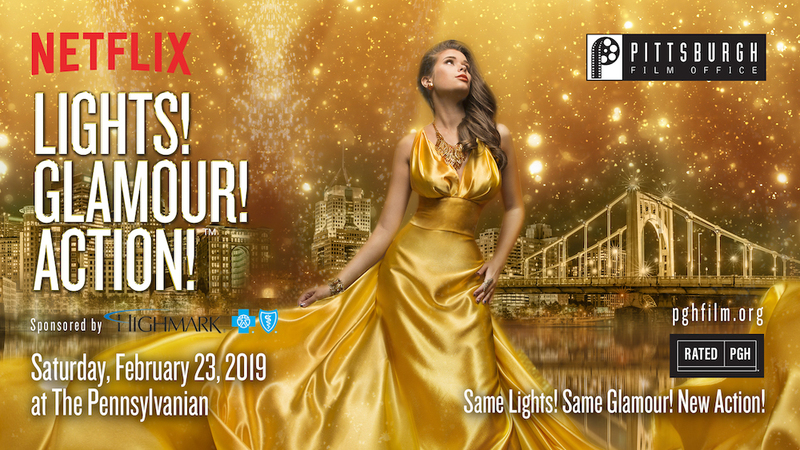 ® Gala Sponsored by Highmark Blue Cross Blue Shield at The Pennsylvanian from 8 PM to 11 PM on Saturday, February 23rd, 2019. Celebrate the annual fundraising event on Saturday night for the first time in 19 years, featuring new action and Oscar® predictions. Enjoy an elegantly gilded evening from the red carpet under The Pennsylvanian’s rotunda, to the runway fashions inspired by the entertainment industry. Local restaurants and participants including: Eddie V's, A519 Chocolate, Blume Honey Water, Braddock’s Pittsburgh Brasserie,Double Wide Grill, Molinaro Ristorante and Bar, Monterey Bay Fish Grotto, Pittsburgh Smokehouse, Pittsburgh Smokehouse, Parrot Bay Cafe, Pittsburgh Po-Boy and Parkhurst Dining will showcase decadent selections to enjoy while guests partake in Oscar predictions, live music and dancing. Join us in celebrating the film industry in Pittsburgh! Take advantage of zTrip promotional code pit10 for $10 off your next ride!